Peeter Joot's Blog » Shipping with UPS from US to Canada. Prepare to be screwed. Shipping with UPS from US to Canada. Prepare to be screwed. For reasons unknown, Canada customs decided that I should have to pay 11 cents on items I’d been sent after loaning them to a US resident. 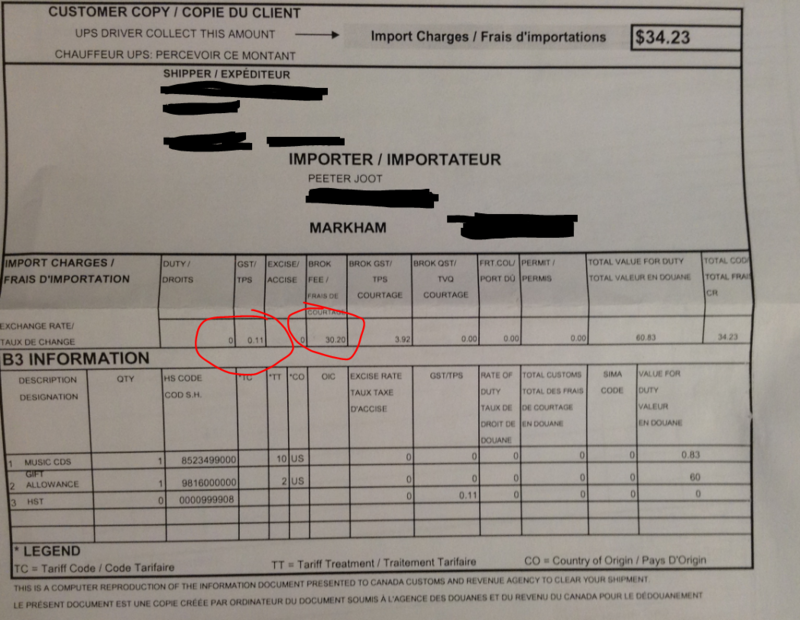 Observe that because UPS paid that 11 cents fee at the border, they tacked on their own $30 brokerage fee (plus GST). I can’t imagine that this is legal. If it is legal, I’d recommend people boycott UPS as a shipping company when sending from the USA to Canada. They basically have found a way to double charge for the package, once explicitly to the sender, and once to the receiver. However, this isn’t the first time I’ve been charged handling fees of this sort. I think the previous time it was FedEx, and they charged something like $15-$20 for paying a couple dollar customs fee. If all the big shipping companies are playing this sort of dirty game, there are not many possibilities for boycotting them. I’d not be surprised at all if somebody in Canada customs management is getting a kickback from UPS and friends to facilitate addition of trivial fees that these companies can use to justify their brokerage fees. 1. Never have your package cross the border via UPS ground. For whatever reason, UPS ground fees are far less predictable than UPS air (and any savings you expect via using ground is usually lost as a result). 2. If possible, use a service that allows you to pay all service fees up-front. 3. In my personal experience, Purolator is basically 80% of the unpredictability of UPS with 80% of the cost of FedEx. i.e. Just avoid it. If you want inexpensive, use UPS air. If you want reliability and predictability, use FedEx. I’m not sure how I would have applied those instructions to myself. I didn’t ship this myself, so I didn’t have a tracking number or enough advance knowledge to know to get the brokerage paperwork done before it was sent back. It wasn’t until UPS left a sticker on my door that I even knew I’d been sent this item. The sad irony is that it was already an item I owned, it was just being returned to me, so I shouldn’t have had to pay any tax on it, not even the 11 cents.